The technology of yesterday is rarely given the respect that it deserves, as it helped to inspire the gadgets that we can’t seem to take our hands off of today. No PS3 without the Atari, no iPhone without the brick phones of the 80’s and no MacBook Pro without the Apple Lisa. Even though these early gadgets paved the way for the technological advances of today, I still can’t help but get a laugh out of 55lb. 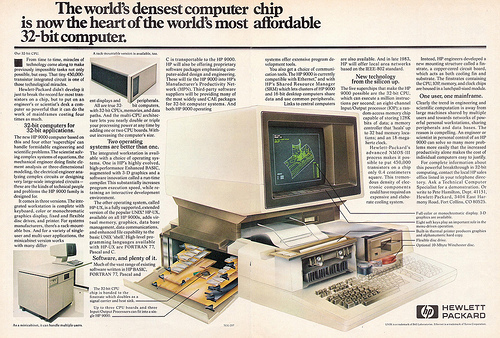 laptops and 64kb of storage that was considered top of the line tech 30 years ago. 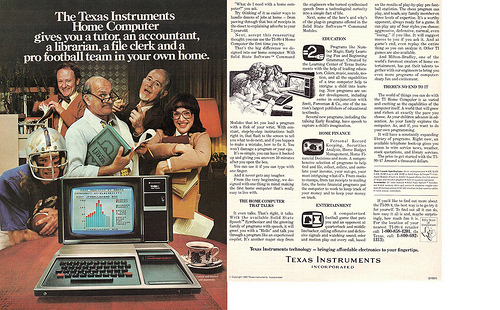 Without further ado, here is a collection of 35 Vintage Tech Ads featuring print ads and commercials. 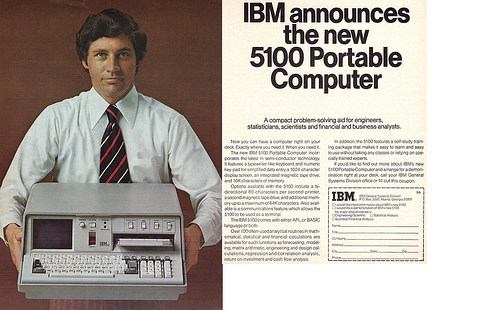 Weighing in at 50 pounds, the IBM 5100 Portable Computer made its debut in September 1975. Available in 12 different models, the 5100 had a maximum capacity of 64k of storage. This “laptop” could be yours for a cool $8,975 – $19,975. 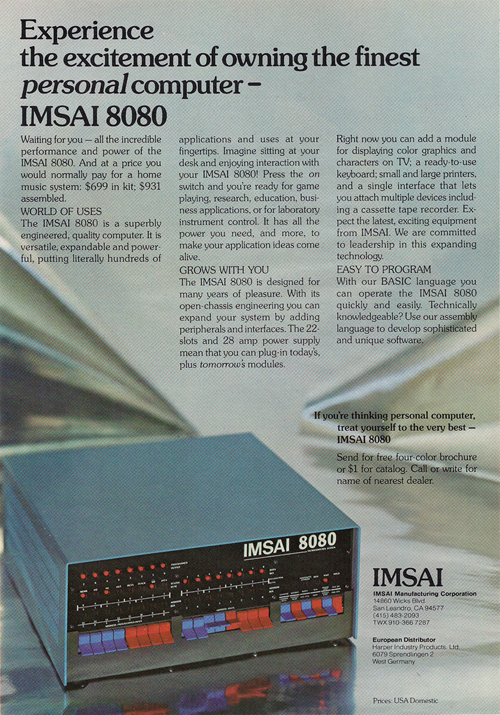 The IMSAI 8080 was an early microcomputer launched in early 1975. Some of its uses include small business data processing applications, computer sciences education and development and military and general government applications. If the IMSAI looks familiar to you, then you may recall seeing it in the 1983 pop culture movie WarGames starring Matthew Broderick. 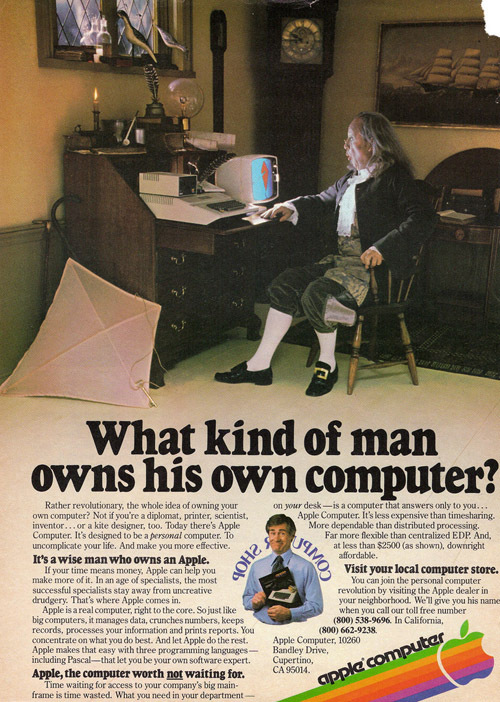 Ben Franklin using his Apple Computer to work on kite design. 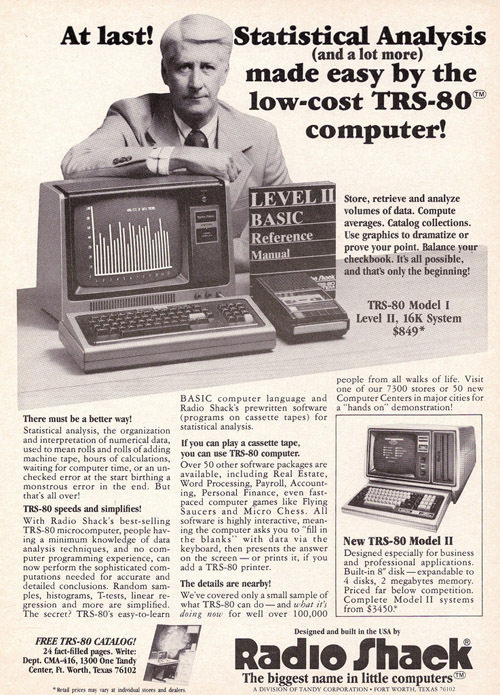 Made by the Tandy Corporation and sold through their Radio Shack stores, the TRS-80 was released in 1977. 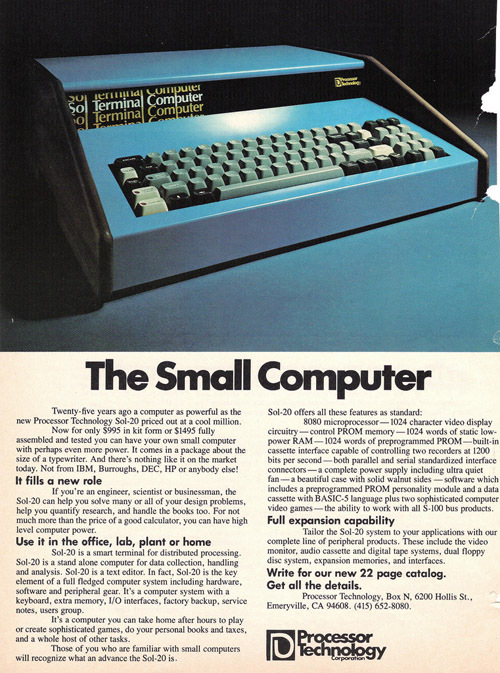 It included a full-stroke QWERTY keyboard, smaller size, and a monitor. Starting price $600. Hewlett Packard showing off one of their 80’s model computers. 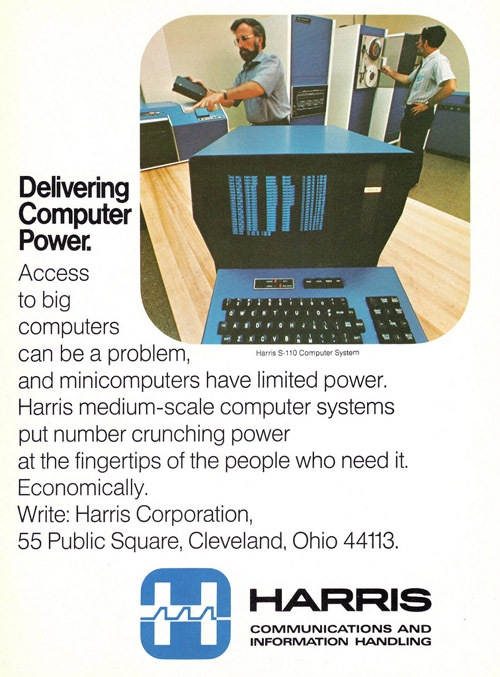 The number-crunching power of the Harris computer. 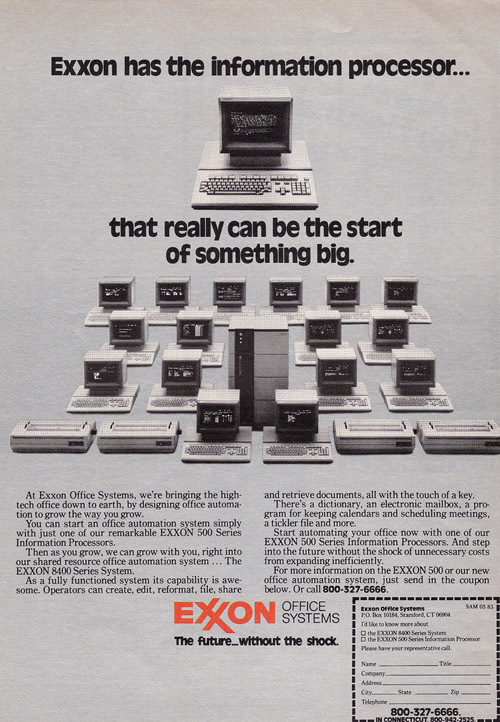 Apparently Exxon once made computers. Fully stocked with a dictionary, an electronic mailbox, a program for keeping calendars and scheduling meetings, and a tickler file. I need to call and make sure that my current computer came with a tickler file. “If you’re an engineer, scientist or businessman, the Sol-20 can help you solve many or all of your design problems, help you quantify research, and handle the books too. 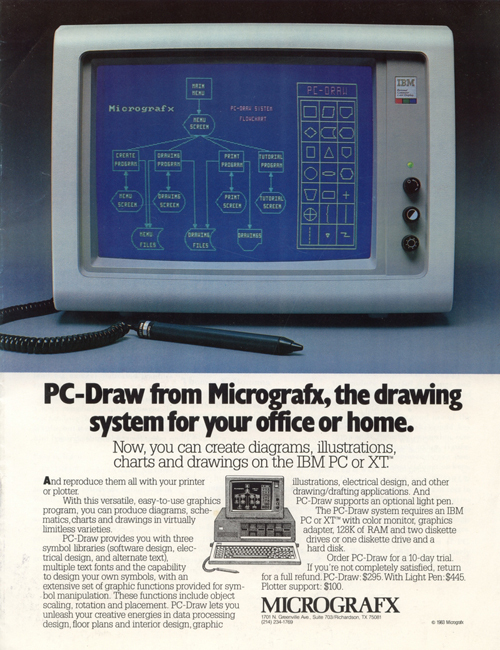 For not much more than the price of a good calculator, you can have high level computer power”.$1,495 fully assembled and tested. 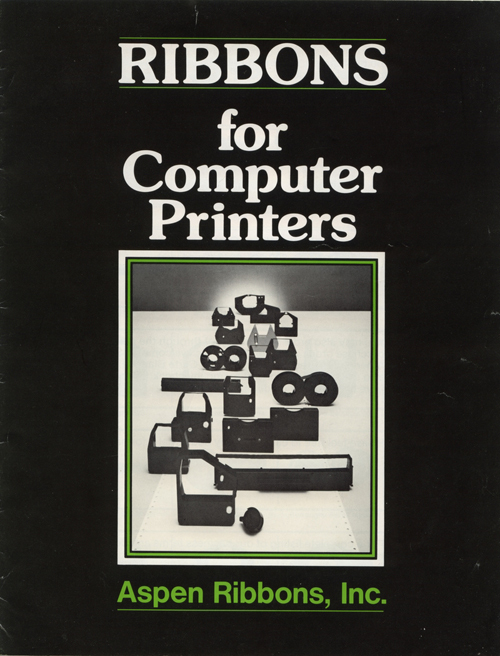 Released in 1979 at a price of $1,150. 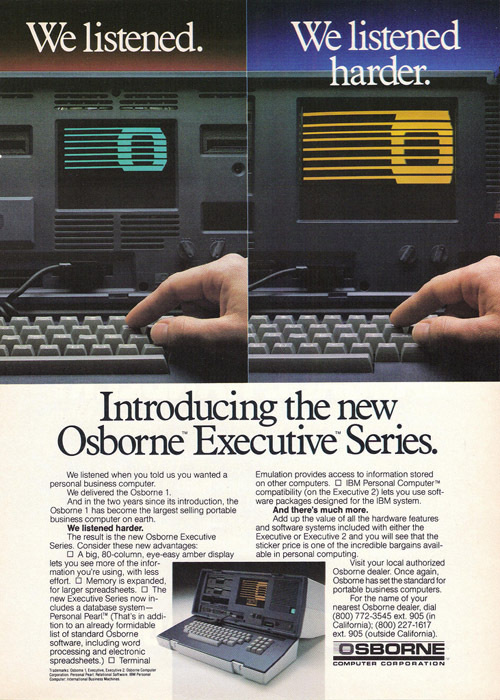 It was followed by the TI-99/4A which added an additional graphics mode, “lowercase” character comprised of small capitals and a full travel keyboard. 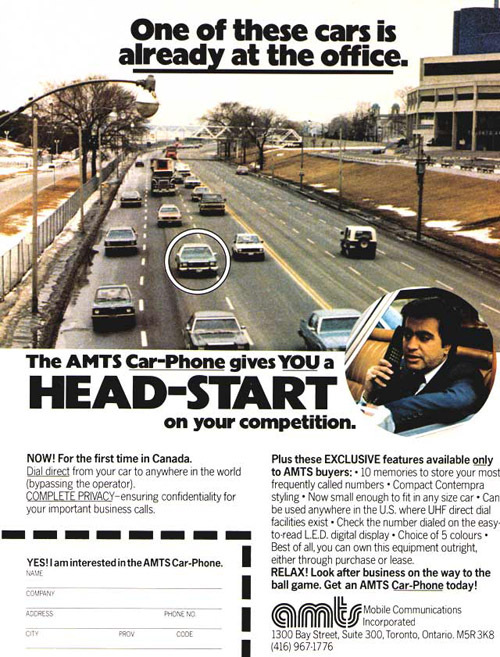 I could not find much info about AMTS, but apparently it allowed this guy to start work well ahead of his fellow employees. 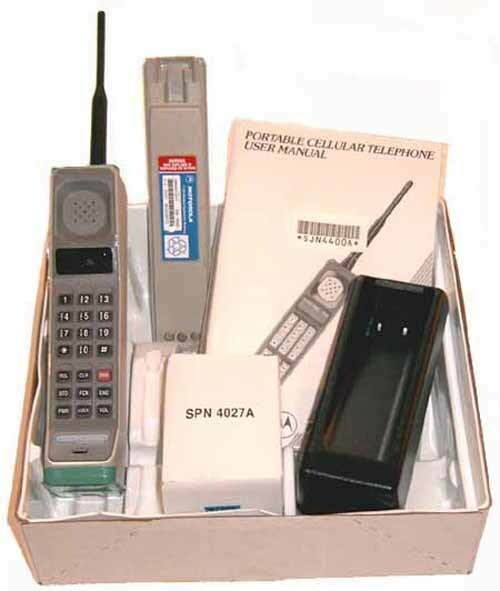 In 1983 the Motorola DynaTAC 8000X received approval from the FCC and become the world’s first commercial handheld cellular phone. You may recall seeing this phone on TV, it was used by Michael Douglas in the 1987 movie hit Wall Street, Zack from Saved by the Bell called Kelly on this phone several times, and more recently Tommy Vercetti made use of it in Grand Theft Auto: Vice City. 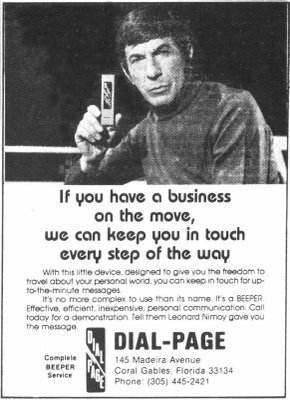 Is seems as though Leonard Nimoy (aka “Spock”) was pushing beepers in his early days. 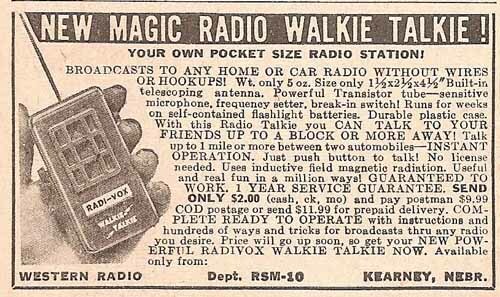 Broadcast through any radio and talk to your friends from up to a block away. It’s like magic. 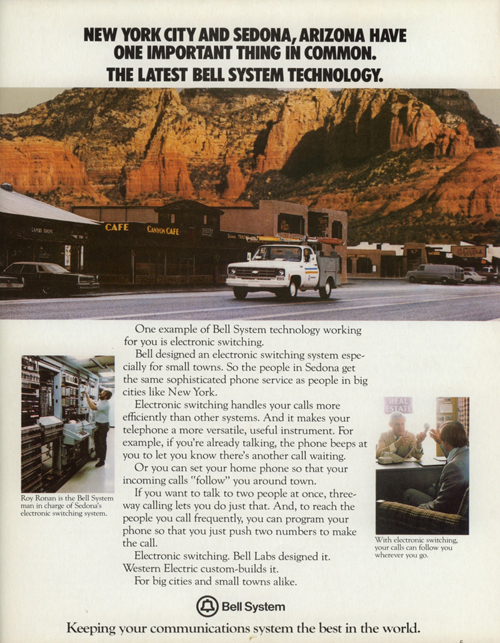 Bell was apparently transforming small towns in 1979. 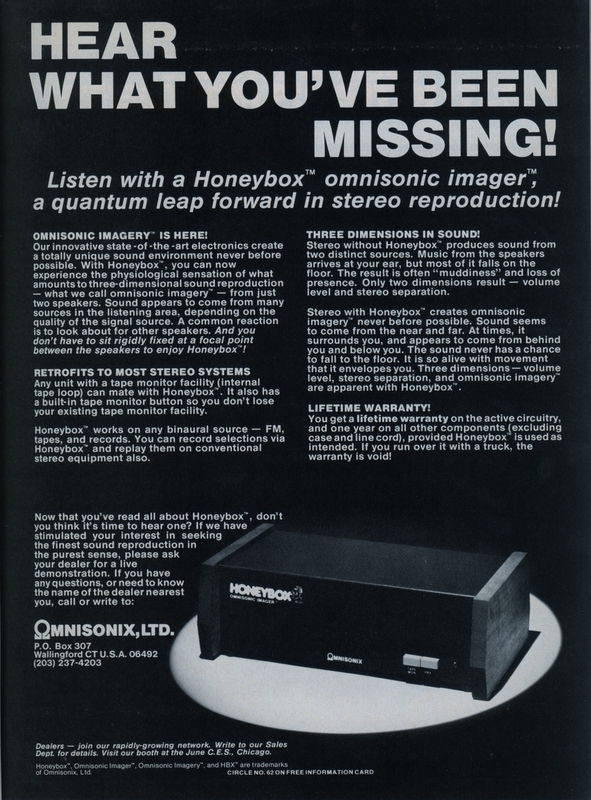 Magnavox brought the first home video game system to the market in 1978, named the Odyssey. 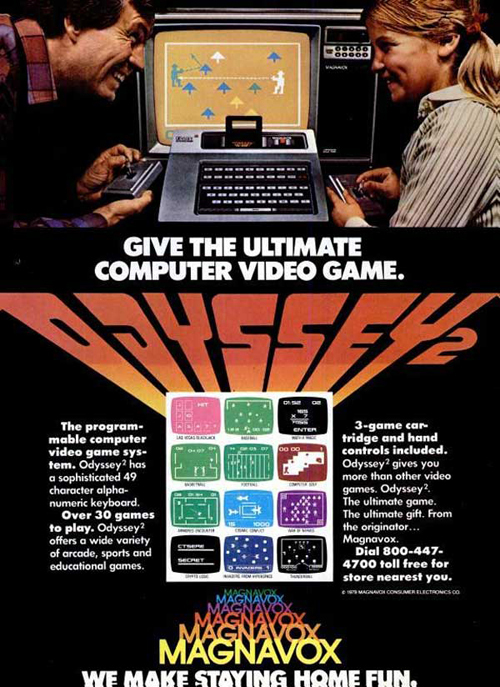 The Odyssey 2 was next in line and was designed to play programmable ROM cartridges. 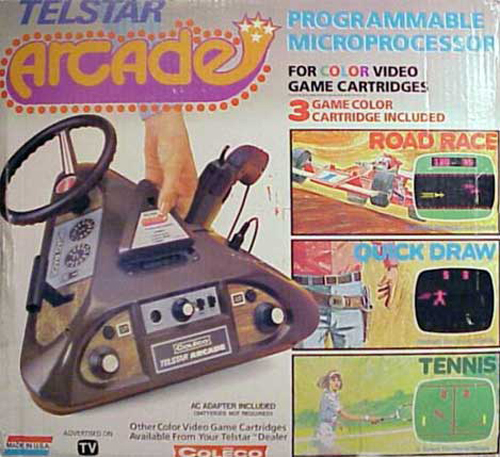 Produced by Coleco, Telstar is a series of video game consoles released from 1976 to 1978. There were 14 consoles released in the Telstar branded series. 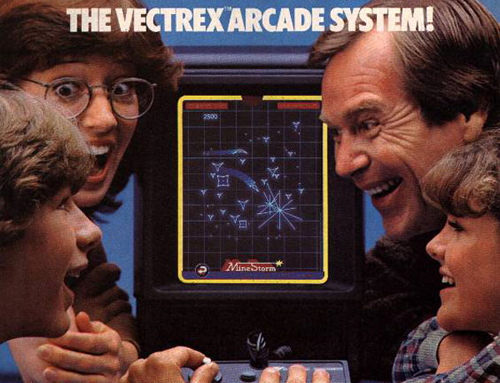 The Vectrex Arcade System came with its own integrated vector monitor. The mom in this ad is a little too excited about the family’s new arcade system. 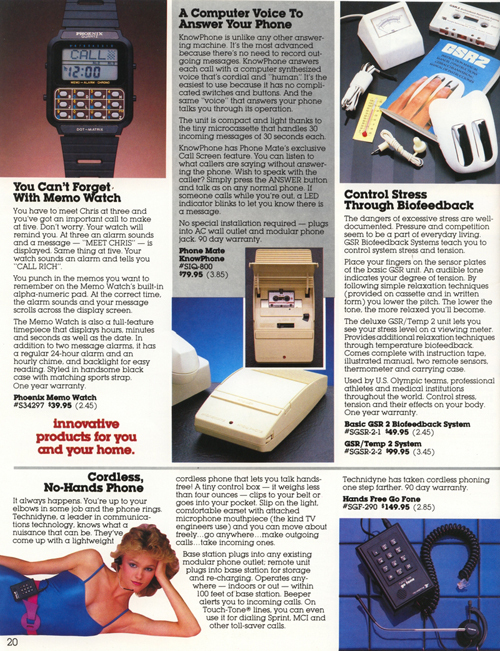 You could pick one of these up in 1982 for $199. 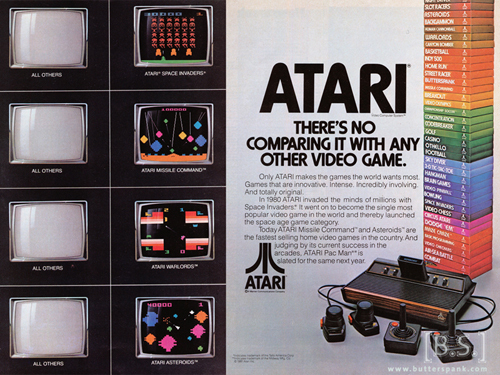 Atari Inc. was founded in 1972 and their gaming system eventually became a rising star to gamers. 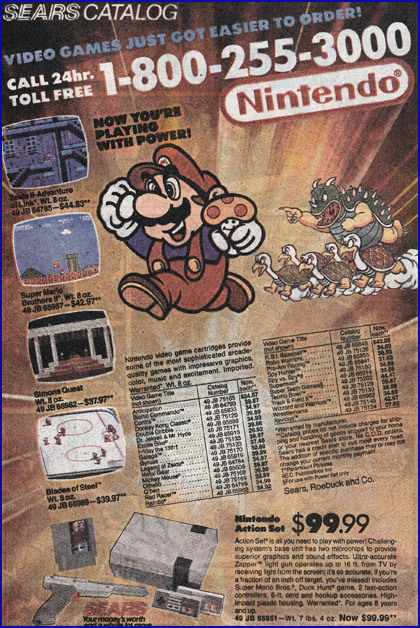 The Nintendo Entertainment System sweeped across North America in 1985 and featured several classic games such as Super Mario Bros, Duck Hunt and Donkey Kong. Here you can buy the action set for a mere $99.99. 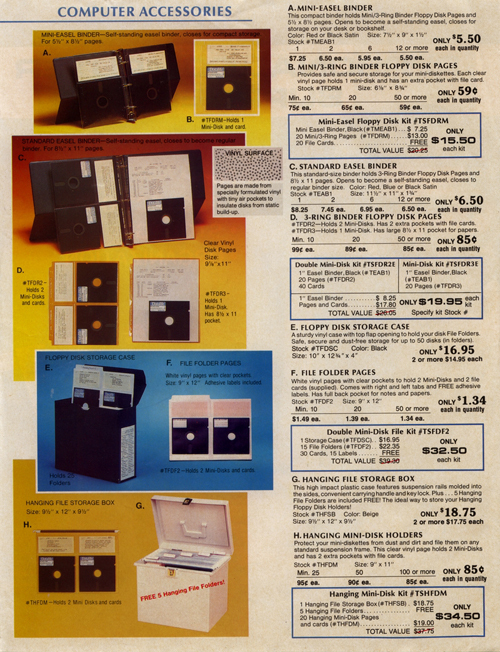 Keep your floppy’s safe with these storage devices. I must be too young to remember these. High-tech gadgets in their day. It is absolutely amazing how far technology has come and how much we take advantage of it. Image breaking a PC 20+ years ago? Your parents would kill you, now it is almost common place. I just bought a totally unused Motorola 8000X brick with two batteries, charger, and unopened manual. Owning technological history is very satisfying. One of my heirs will take it to Antiques Road Show in the 22nd Century and be told it is worth a fortune.